Once the scourge of travelers across the globe, pirates seem to proliferate in popular culture -- movies, books, even musicals and cartoons. The Victorian era began a romanticization of the "Golden Age" of piracy that has continued to this day. Sir Walter Scott, Daniel Defoe, Robert Louis Stevenson, and Sir Arthur Conan Doyle all wrote pirate-themed novels. Edgar Allen Poe put his pirate in a short story while Lord Byron told his pirate tale through verse. Gilbert and Sullivan's pirates sang and danced across the London stage. Errol Flynn, Walter Matthau, Anthony Quinn and Douglas Fairbanks all starred as pirates on film. Tyrone Powers played a reformed pirate while Gene Kelly played a man pretending to be a pirate. Disney's Pirates of the Caribbean film franchise has grossed more than $3.5 billion for the company -- with nearly $1 billion of that coming from the movie released just last month. 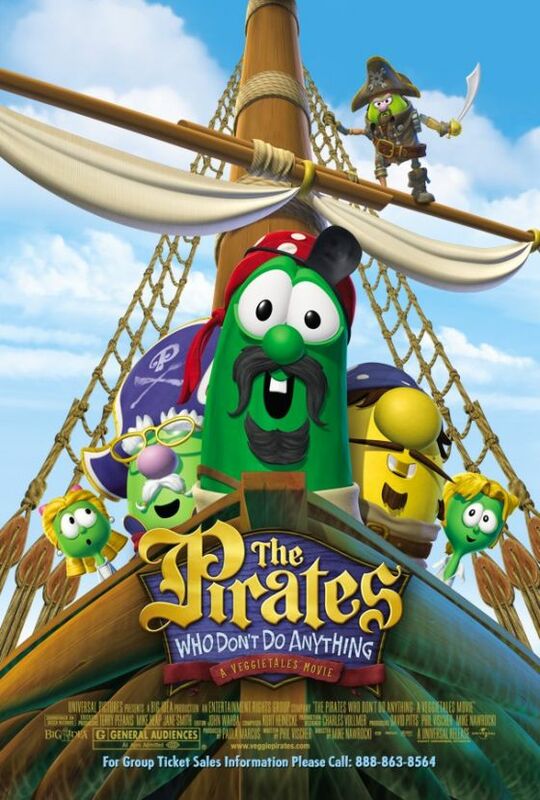 Even Larry the Cucumber and the Veggie Tales gang have had roles as lovable (if inept) pirates. Floridians have to wait until fall to cheer on their Buccaneers, but if you live in western Pennsylvania, you can root, root, root for the home team Pirates to win tonight. And then there are the host of colleges and high schools with pirate-themed mascots. There is even an international Talk Like a Pirate Day (September 19 for those who want to begin practicing early). Last weekend, I traveled with my family to the Outer Banks -- the string of barrier islands on North Carolina's Atlantic coast -- for a trip that combined research (for me) with a couple days of relaxation (for them). I was looking for information about shipwrecks, but I found Pirate Central, USA. 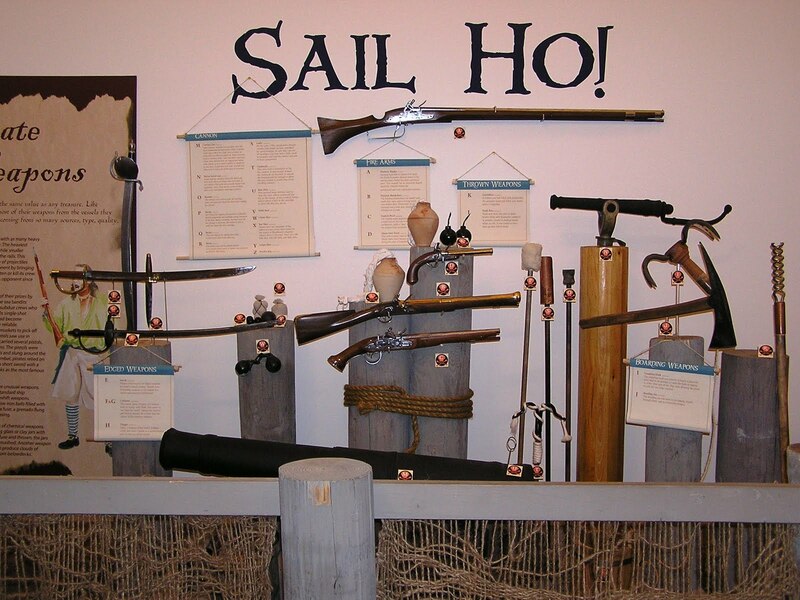 Few places in the US can rival coastal North Carolina for pirate lore. The most infamous pirate of them all, Blackbeard, spent his final months there. Historians aren't certain what Blackbeard's real name was. It may have been Edward Drummond, although he also used the names Edward Thatch and Edward Teach. He was probably born around 1680 in England and served as a privateer during Queen Anne's War (1701-1714). When the cessation of the conflict brought an end to privateering profits, Blackbeard, like many of other privateers, turned to piracy. Blackbeard captured the French ship La Concorde in late 1717 and renamed her Queen Anne's Revenge. After wintering in the Caribbean -- and adding more ships to his growing fleet -- Blackbeard set his sights north toward what is now the US mainland. After a brief blockade of Charleston in May (ended when the city paid a ransom of one chest of medicines), Blackbeard continued north and ran his ship aground at Beaufort Inlet, near Beaufort, NC. He settled in Bath and reformed (briefly), received a pardon, and remarried (for the 14th time). 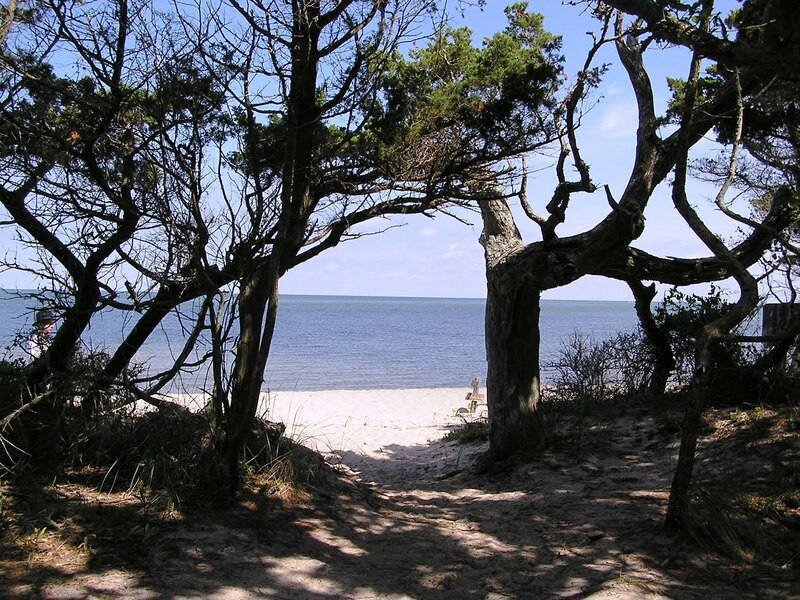 Ocracoke Island, NC, overlooking Teach's Hole, the channel where Blackbeard and his fellow pirates moored their ships. ﻿But the newly respectable Blackbeard soon returned to his roots with another act of piracy. In October, he hosted history's largest gathering of pirates on Ocracoke Island. The people of America had had enough of Blackbeard and called on Governor Spotswood of Virginia to deal with the problem. Spotswood sent both land and sea forces to capture the notorious pirate. On November 22, 1718, Lt. Robert Maynard of the Royal Navy caught up with Blackbeard and his crew, and the pirate leader died in the ensuing battle. Maynard cut off Blackbeard's head and tossed his body into the sea. Legend says his body swam around the ship seven times looking for his head. But Maynard took the head to Hampton, Virginia where the governor displayed it on a pike as a warning to all would-be criminals. I'll admit to enjoying a pirate adventure movie as well as the next person, but there's a certain irony in our modern tendancy to idealize these men. In reality, they were nothing more than common thieves. Over and over in the Bible, God warns us about the consequences of sinful living. "The fear of the LORD adds length to life, but the years of the wicked are cut short" (Proverbs 10:27). And while we can name all manner of exceptions to this generalization, we know that violence puts a person in high risk categories for an earlier death. The new Pirates of the Caribbean movie features Blackbeard as one of the characters. However, at 69 years old, actor Ian McShane is nearly twice the age of Blackbeard at his death. A trait common of pirates was that they did not enjoy their ill-gotten gains for long. It seems most people don't like having their property forcibly taken from them. They fight back, and they band together to form governments that fight on their behalf. Consequently, pirates tended to lead short, violent lives. God gave us guidelines for our behavior, and we violate his commands at our own peril. As the only female in a household of guys, I'll probably end up seeing this new pirate movie. After all, I've seen all the others. At the risk of being tarred and feathered, I admit that Jack Sparrow doesn't, er, float my boat (I think it's the eye makeup). I'd have to name Cary Elwes as my favorite cinematic pirate -- the dread pirate Roberts can rescue me from midget Sicilians, giants, and six-fingered men any day. Do you like pirate movies and stories, or are you ambivalent about the genre? What are some of your favorite pirate-themed stories? Interesting post, CJ. As I was reading, I found myself wondering what it would have been like to witness a pirate gathering on Ocracoke Island. Not in a romantic sense, but in a "people-watching" sense so I could study them and figure out their motivations. That's kind of strange, isn't it? I don't know why we tend to romanticize pirates in modern culture. Maybe it's that "dangerous men" phenomenon? Maybe some inner part of humanity looking for the "bad boy" to reform? I think deep down a lot of us try to find the good in people, and maybe that's where the tendency to romanticize it comes from - the retelling of stories over and over in hopes of discovering what made the dastardly pirate into a bad boy thereby turning him into a hero? I don't know if you still can, but you used to be able to change your language in facebook to pirate. All the notices came in pirate speak. Pretty funny. I have to admit, my favorite Pirate movie is Muppet's Treasure Island. I've always had a love of all things Muppet. Thanks for the interesting post, CJ. Perhaps it's the notions of buried treasure, ancient maps, and sailing the high seas which appeals to us, but our culture certainly romanticizes pirates. Today's pirates are still really scary. A missionary couple from my town were murdered last year by Somali pirates for their sailboat. This couple was delivering a shipment of Bibles to a community in Africa. I am still shaking my head at the tidbit that Blackbeard had 14 wives and died before he was what, 40? Whew. I'm holding back from commenting further. Suzie, my other theory on our romanticization of pirates is that we have deep seated issues with authority (which seems to be part of human nature going all the way back to the Garden of Eden), and there's a part of us that wants to "stick it to the man," so to speak. A fictious pirate who lived hundreds of years ago (and is really a nice guy at heart) allows us a safe way to defy authority vicariously. Barb, I saw the Muppet movie when I was looking through the list of pirate movies, but I forgot to mention that one. Yosemite Sam was also a pirate in some Looney Toons clips. Very fun post, CJ. When I visited Wilmington, NC a couple years ago I was fascinated by all the pirate lore in the area. I think we "like" pirates for the same reason we "like" vampires, and gamblers, and outlaws like Butch Cassidy and the Sundance Kid... it's that innate desire to reform the bad guy! I suspect the pirate gathering wouldn't be much different than the modern biker gang ones. - Swashbuckler, 1976 Romantic Adventure starring Robert Shaw as Captain 'Red' Ned Lynch and Genevieve Bujold as Sir James Barnet's daughter. - The Pirate Movie, 1982 musical romantic comedy spoofing Gilbert and Sullivan's comic opera, The Pirates of Penzance and starring Kristy McNichol and Christopher Atkins. This movie has always captured my interest although I'm not a fan of mixed genres and silliness. ie - Ninja's and Indian Jones jump into the fray between pirates and English bobbies. I was thinking over why I like these movies so much and I think it's because both heroines pick up a sword and defend their turf when threatened. Niki, I haven't been in the Wilmington area in forever. Years ago a writer friend told me she loved to read and write about bad guys -- but that she'd never actually want one in real life. Barb, Muppet Treasure Island is a favorite at my house. Love the songs and the one liners..."How does she do that?" I loved the first PotC movie, but not so much 2 & 3. The latest one was much better. CJ I read your post on time.. but blogger was not nice to me that day. First,I had to sigh over any mention of the OBX- Ocracoke and Hatteras Islands... Sigh. I guess the romanticism comes from the part of us that thinks it would be great to rebel against rules --or replace with what appears to be freedom. Does that mouthful of rum in the morning replace brushing and flossing?